This AAA Five Diamond award-winning resort offers 90 beachfront suites and is focused on wellness, serenity and romance. Consistently named one of Mexico's most exceptional boutique resorts, it is set on 14 acres along Cancun's famed Riviera Maya and includes a secluded beach. Guests enjoy dining at La Canoa, a AAA Four Diamond award-winning restaurant. Relax at the Thalassotherapy Center and sail on the resort's private 48-foot catamaran. Amenities include Endless Privileges™. 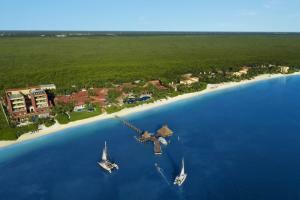 Located on the Riviera Maya, only 20 minutes from Cancun International Airport.